It is a Pele Tower, or more properly a Tower House. In the Middle Ages, whenever the English King’s attention was distracted, the Scots lost no opportunity of invading northern England. 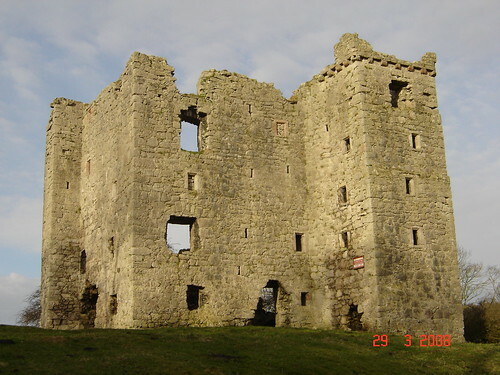 Castles and Pele Towers were constructed to provide protection, and in north-west England between the River Lune and the Scottish border over one hundred were built. Peles were smaller, less well fortified, then castles. They were intended to counter lightly armed raiders rather than to withstand a siege by a properly equipped army. 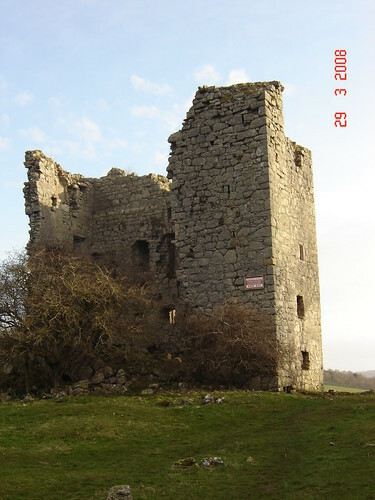 Arnside Tower was built by the De Broughton family around 1340. It was damaged by fire in 1602, but was rebuilt and survived intact until 1690. In 1815 it was sold to Daniel Wilson of Dallam. In 1884 one corner fell in a great storm. Much of it is still standing, although it is gradually disintegrating. Unfortunately, little or nothing is being done to halt the process of decay. Pele Towers tended to conform to a pattern. They were usually three storeys high, but Arnside had four. The ground floor contained the dairy and store rooms. Stone steps led to a first-floor entrance, with a heavy oak door and a protective iron grille. Fire-places and latrines were built into the walls, which were up to 10 feet thick. A spiral staircase connected the floors. Arnside Tower occupies an interesting position. It is sited on a saddle, or col, between Arnside Knot to the north and Castlebarrow to the south. To the west the land slopes to the shore, and on the east to the Arnside and Silverdale Mosses. It is within visual or signaling distance of several other Peles in the area, e.g. Hazelslack, Borwick, Beetham, Levens, Sizergh and Allithwaite (across the sands). I find it quite astonishing that this piece of history is sitting in a field slowly crumbling. Perhaps, however, it’s better off being benevolently ignored, rather than becoming some kind of tourist attraction. 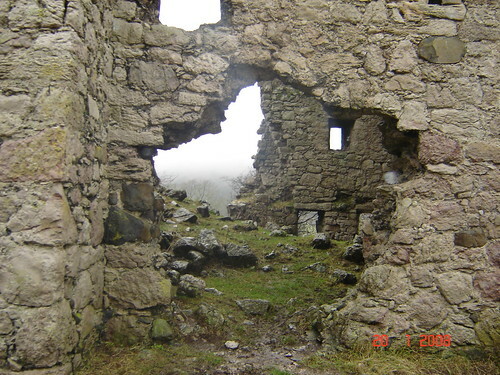 There are stern signs warning that the tower is not safe, but if you do venture inside, you can see that the remaining walls retain fireplaces, passages, doorways and perhaps even that spiral staircase. David Peter’s account of the tower’s history is more complete than any other I have seen. However, it’s not entirely satisfactory: what happened in 1690? And between the fire in 1605 and whatever did occur in 1690, was the tower involved in the Civil War? Thanks for David Peters’ account of this building. It’s pretty well left alone, but just the fact it’s on the internet means others will be interested and the present situation of being benevonently ignored is changing to it being a ‘tourist’ attraction. (Am I a tourist, being a local person with an interest in the civil war?) So yes, what did happen in 1690 – and was it involved in the civil war? And perhaps more importantly, can anything be done to save its deterioration? It’s such a grand land mark. It would be nice if someone would get that tree growing right next to it out of there so it won’t destroy the tower. That’s the largest menace I see. I’ve looked at quite a few photos of this tower and haven’t seen anyone have their photo taken with it yet. We went to visit this last summer, and all we found was wasteland. We checked our location by GPS – we were definitely at the location of the tower according to our map, and everything else was where we expected to find it, but where Arnside Tower should have been, there was just a few stones in the ground and evidence that some heavy machinery had been around not too long ago. Golly John. Don’t know how you missed it. It is clearly visible from the Silverdale to Arnside road when you reach the slopes of Arnside Knott. I was there last Sunday – first visit for 70 years. Well worth a trip. Hope you can make it!!! Glad you enjoyed your visit. I’m also a bit puzzled by how John missed it! Lovely to see interest in Arnside Tower. I was brought up in Arnside and spent a lot of my childhood playing as knights in the castle which was just up the road from my home. I shudder now to think that a friend and I scaled the outer wall one day as a dare! It was rumoured that there was a tunnel from the castle basements to the shore in the dip towards Silverdale although we thought it exited at what I believe is the remains of a lime kiln near the castle. It’s sad to see it slowly decaying whilst the Pele Tower at Beetham is listed and in good repair Certainly that tree needs to be taken out. I also remember playing in and on the tower in my youth, we used to cycle there from Carnforth to climb the spiral stairs from the entrance door to the top of the walls and scale the inner walls. I have often wondered why no-one has at least stabilized the building. It does seem astonishing that the tower has been there for so long and that no public body is no safeguarding it’s continued exsistence. I suppose it would be English Heritage that would be responsible? anyone able to tell me the best way on foot from the railway station at arnside? Not what you asked for I know, but it’s as close to Silverdale Station: turn right out of the station. Look for a footpath on the left which crosses the golf course. Once across the golf course, turn right on The Row. Follow that generally quiet country lane, until it ends at a T-junction. Go straight across the junction into the Jubilee Wood car park in Eaves Wood. A path (not shown on the OS map) heads North where it meets a another path. Turn right and follow a path which climbs along the lower edge of the woods. Stick with that path. It eventually brings you to a road: Castlebank. Turn right, uphill. The road becomes a path and takes you through woods to Holgates Caravan Park. Follow the path through the campsite to the Tower. With an OS map (OL7) in hand you could then take one of several options into Arnside. For example: go straight on onto Saul’s Drive. Just follow that up and over the ridge of the Knott. It goes into a car-park and then a minor lane. When the lane reaches a T-junction, look for a left-turn down past the YHA to the river. Follow the promenade through Arnside and then keep following the road – it will bring you to Arnside Station. If you want to get there from Arnside station, its about 1.5 miles. Come out of the station, cross road and bear left past the garage and then immediate right up through the farm. A pleasant path takes you up to Silverdale road, by the Catholic church (once my old Arnside National primary school…in the good old days!) Go left up Silverdale Road and as you get up past the cemetery you’ll get a great view of the Tower which you can get to by walking down to the farm. Hazelslacks – yes it’s a wonderful place, as is the Fairy Steps. Haven’t been that way for a while. Hmm…. On the south wall I saw 4 fireplaces stacked above each other,in the south west corner a gardrobe tower again 4 stacked above each other.On the north wall only 3 fireplaces whose floors do not align with the south wall. 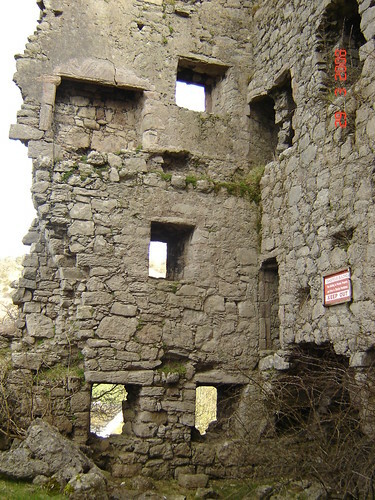 A spiral staircase within a triangular structure on the east wall but in the north east corner a hollow rect.tower that may have housed a wooden staircase;I suggest this means 2 major stages of building. RMH,Cornwall. I live in Arnside. Have you heard of the book, “Westmorland Dialogues: Ann Wheeler of Arnside Tower”? I think it’s essentially a journal of a woman who lived in the tower hundreds of years ago. I thought some of you may be interested. Here’s a digitised version….it’s very dificult to read as it’s in dialect! This is quite fascinating! I was brought up in Arnside and spent a lot of my childhood attracted to the Tower which was close to Mount Pleasant where I lived. It was a wonderful if rather dangerous playground for me and I’ve always been interested in its history. Makes me want to get back up to the north west. I know Morecambe and I know Grange and Cartmel quite well but I’ve still got some exploring to do around Silverdale and Arnside part of the bay. Good post. Hello. This looks like a lovely little piece of history and would be a great backdrop for a small short film I’m making. Does anyone know if this is open to the public or is ti privately owned? Because I noticed on Google maps that there’a a farm very close to it. There’s a public footpath which goes right past the tower. The tower itself has numerous ‘Keep Out’ signs on it, presumably because it is in a state of collapse and the land owner won’t want anyone to be injured by falling masonry etc. If you were going to film there, I think it would be both politic and polite to seek permission from Arnside Tower Farm, which, as you say, is very close by. This is all really interesting. I’m planning a new ‘history based’ coast to coast walk from Arnside to Filey, with a view to organising guided walking holidays for people. The idea is that people will learn about the history of England as they walk across the country. The route will go past the tower. I am in the process of researching the history of the places along the route, so this website has been very useful. Thanks to Robin for the link to Anne Wheeler’s dialogues which are fascinating. I wish I’d lived near the castle as a child, as I would have loved playing in it! I’m staying in arnside in November and would like to metal detect the surrounding fields with my 5 yr old. Is it tower farm who I would contact for permission? Interesting. I have never heard of Pele Towers. Sounds like an indoor proving ground for Brazilian football legends. The photos remind me of the tower on Haldon Hill, near Exeter. Not much room inside for the beautiful game!